area. They also have something to offer for everyone, whether you are an experienced kayaker or just a beginner. Lazy Dog gives you the option to take one of their popular guided tours or for the adventurous types you can venture forth on your own. Lazy Dog Kayak Rentals is located just across the Key West bridge on stock island at the Hurrican Hole Marina, mile marker 4.2 on highway US1 Key West, Fl 33040. Lazy Dog gives you the option to explore on your own or take a guided tour. Lazy Dog will provide you with a map of the Key West area and inform you about the places you will want to see or best route to take. They are open daily. Lazy Dog offers you a chance to take a guided tour with a seasoned local guide who will lead you through an exploratory tour of the islands mangroves and tranquil shallow water areas. You'll have a chance to learn about the Key's diverse marine life as well as viewing many of the areas bird species. combined. This tour will explore some of the more remote backcountry areas of the Keys including remote mangroves and islands. 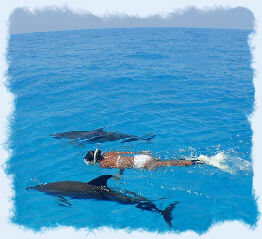 You'll have an opportunity to snorkel and swim with many species of fish, rays and even sharks. The Coast Tour is available on Monday, Wednesday and Fridays. The tour meets at 9:15 A.M. at the Hurricane Hole Marina and from there you will be transported (free of charge) to another location fourteen miles up the road to their access site. There you will experience a winding journey where you will learn about the areas history and unique ecosystem. This Lazy Dog odyssey adventure was even featured on a national television show on the Discovery Network. 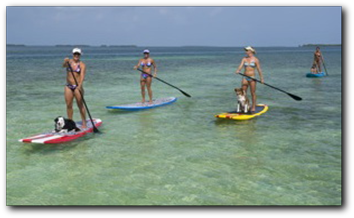 Paddleboarding is one of the newest water sport crazes to hit the Key West scene. Paddleboarding is a fun activity that is easy to master and can be enjoyed by the whole family. Paddleboarders stand on an oversized surf board and use a long oar to propel their way through the water. If you're a beginner the excellent staff at Lazy Dog will give you some quick pointers before you embark on journey. Rentals need to be confirmed in advance and you can reserve a paddleboard by calling (305)295-9898 or by visiting the Lazy Dog website at: www.lazydog.com to access their online reservations. similar to their kayak tours. You'll cruise through remote mangrove swamps and paddle in pristine waters where you'll be able to view underwater structures and various marine creatures. Lazy Dog offers tours daily and it's great for both beginners or experienced paddleboarders. Their guides will instruct you in the basic standup method of paddleboarding. The boards are quite stable and everyone will be able to master the technique with just a minimal amount of practice. Paddleboard Yoga is also one of the newest activities that Lazy Dog has to offer. Any of the yoga techniques can be modified to fit the beginner or advanced yoga student. You will never find a more relaxing and peaceful environment to relax and find your perfect state of inner peace and tranquility. Listen to the birds and wildlife as you float peacefully and bond with mother nature. Fantastic Key West Vacation Rental Condos Right on the Ocean! Click here for more info / Resort Accommodation on the Ocean!